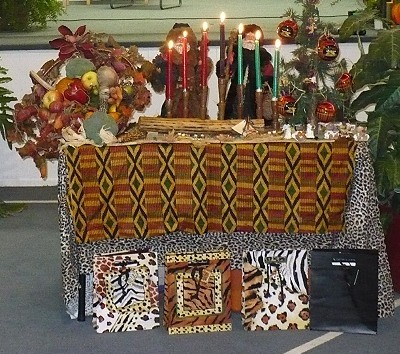 The Clay County African American Legacy Inc. will host the Northland’s 16th Annual Kwanzaa Celebration with a program beginning at 6:30 p.m. on December 30th at the Garrison School Cultural Center, located at 502 N. Water Street in Liberty, Missouri . The program is free and the public is invited to attend; tickets or reservations are not required. The keynote speaker, Archie Williams, is a member of the Kansas City Chapter of the Black United Front. He will speak on the Kwanzaa principle of Kujichagulia (Self-determination). Williams, a writer and social worker has worked in various sectors of the social services field, and created programs for urban youth and families, especially African American adolescent males. He serves on the Bruce R. Watkins Cultural Center Board. Community residents will participate in the lightning of the Kinara which represents the seven principles of Kwanzaa: Umoja (unity); Kujichagulia (self-determination); Ujima (collective work and responsibility); Ujama (cooperative economics) Nia (purpose); Kuumba (creativity) and Imani (faith). The program will also include singing, dancing, and a poetry reading performance by local residents. Liberty High School students participating in the Advanced Studies Educational Mentoring Program (ASEM), which is co-sponsored by the Liberty School District and Garrison School Cultural Center, will receive recognition awards for successful academic achievement this semester. A potluck dinner will be held immediately prior to the program and everyone is welcome to bring a favorite dish.